peek >> << backLooking at the east side of 1st Street north of L, July 2004. March 30, 2018 - A rendering of the 275-unit residential project, passed along as excavation was getting underway. 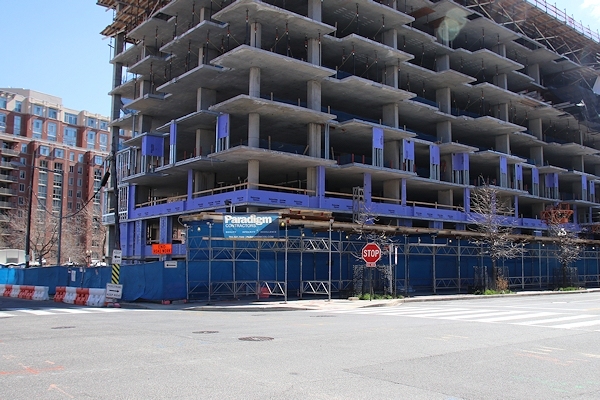 This view is looking down the east side of 1st Street SE from K Street. The purple lights are designed to change colors. Note that there will be no retail in this building. 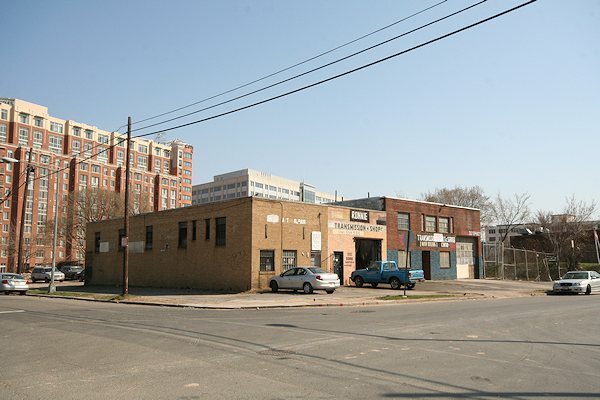 June 28, 2007 - The east side of 1st Street SE between K and L in its previous life, in an angle similar to the above rendering. The garages were demolished in 2011. March 17, 2019 - A similar view to the above photo. Excavation began in mid-March 2018, and by the beginning of 2019 construction was above ground level. Aug. 21, 2003 - What the south end of the block looked like in the summer of 2003. The Market Deli was demolished in 2011. March 17, 2019 - The same angle (more or less), currently. The old days, and now. September 16, 2007 - Standing at New Jersey and K, looking to the west, in September 2007. March 17, 2019 - The same location, now a nice vantage point to see 1000 1st rising up. October 2000 - A photo from the very first group of JDLand shots taken south of the freeway, in the fall of 2000 (with a film camera!). April 30, 2011 - The Market Deli buildings, with siding removed, a couple months before demolition. July 14, 2011 - The last photo of the old garages--they were gone the next day. July 11, 2011 - Demolition underway on the Market Deli, after an attempt to preserve the building as historic fell through. May 2008 - The rear of the garages, as seen from the alley. April 2011 - A little bit of remnant art on the garage along K Street.